Josie d'Arby marks the 300th anniversary of the birth of Lancelot "Capability" Brown, and Aled Jones samples some biblically-inspired beers, with inspirational hymns and music. 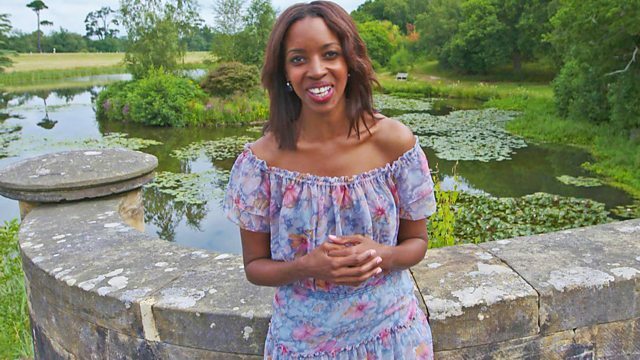 Josie d'Arby marks the 300th anniversary of the birth of one of Britain's most famous landscape gardeners, Lancelot "Capability" Brown, and Aled Jones samples some biblically-inspired beers, with inspirational hymns and music from across the UK. Praise, My Soul, The King Of Heaven from Liverpool Anglican Cathedral. Choir: Congregation of St Mary-le-Tower, Ipswich. Conductor: Noel Tredinnick. Featured Artist: William Baldry. Featured Artist: St Mary-le-Tower Choir. Featured Artist: Christopher Borrett. Featured Artist: Paul Benniston. Featured Artist: Robin Totterdell. Featured Artist: Nigel Hiscock. Featured Artist: Jon Stokes. Featured Artist: Mark Probert. Music Arranger: Paul Leddington Wright. Lyricist: Cecil Frances Alexander. Choir: Congregation of St Alban's Church, Bristol. Conductor: David Ogden. Featured Artist: Richard Johnson. Music Arranger: David Ogden. Lyricist: Cecil Frances Alexander. Choir: Congregation of Ballydown Presbyterian Church, Banbridge, Northern Ireland. Conductor: Jonathan Rea. Featured Artist: New Irish Arts - Orchestra. Composer: Jesse Reeves. Composer: Jonas Myrin Matt Redman. Music Arranger: Jonathan Rea. Lyricist: Chris Tomlin. Lyricist: Jesse Reeves. Lyricist: Jonas Myrin. Lyricist: Matt Redman. Conductor: Geoff Ellerby. Music Arranger: Geoff Ellerby. Lyricist: Eleanor Farjeon. Featured Artist: Dana Masters. Featured Artist: Paul Hamilton. Featured Artist: James Nash. Featured Artist: Gareth Hughes. Featured Artist: John McCullough. Lyricist: James Weldon Johnson. Choir: Congregation of St Colmcille's, Holyrood. Conductor: John Anderson. Featured Artist: Stephen Hamill. Featured Artist: St Colmcille's Choir. Featured Artist: Grosvenor Choir. Featured Artist: The Clare Chorale. Music Arranger: John Anderson. Lyricist: Carl Gustav Boberg. Choir: Congregation of Liverpool Anglican Cathedral. Conductor: Simon Lole. Featured Artist: Simon Lenton. Featured Artist: Fine Arts Brass Ensemble. Featured Artist: David Poulter. Music Arranger: Paul Leddington Wright. Lyricist: H. F. Lyte. The father of landscape gardening, Lancelot “Capability” Brown left an unforgettable mark on the English landscape; such was his brilliance that his designs are often said to resemble nature itself! He spent more than a decade overseeing the design of the Ashburnham parkland and we learn from gardener Jay Ashworth how Brown worked his magic here. We also meet a volunteer who has found sanctuary and inspiration at Ashburnham Place during difficult times. Today a community of Christians live at Ashburnham Place and thousand of visitors also come on retreat. One individual who was fortunate enough to grow up in the Capability Brown designed landscape was Richard Bickersteth. Richard tells how his father, a trainee vicar, came to inherit Ashburnham Place and how the Ashburnham Christian Trust came to be. Dana Masters is originally from America but moved to Northern Ireland in 2008 after meeting her husband Andrew. They founded the Lagan Valley Vineyard Church along with another couple, Yvette and Mark Wilkinson. Andrew looks after the vision and direction of the church and when Dana’s not leading the music at the church she is singing to thousands at music gigs in Ireland, UK and further afield. Aled visists Emmanuales Brewery in Sheffield finding out why they’re brewing beers with a biblical twist.